The capital of the beautiful Sunshine State, Brisbane (or "Brissie" as Aussies affectionately call it) is Australia's third largest city. Winding along the Brisbane River, the CBD blends historic buildings with modern elegance. Although the city's history dates back to 1824, Brisbane rose to the world stage after hosting the Commonwealth Games in 1982 and World Expo in 1988. The mild, subtropical climate together with a relaxed yet sophisticated culture attracted a large numbers of tourists, as well as permanent residents relocating from other Australian states. Today, Brisbane's population is still flourishing as visitors discover its many assets. It's clean, green, and friendly, with an emphasis on innovation and creativity, and you'll find plenty of lush parklands and gardens throughout the city. Families also appreciate the many free attractions and kid-friendly adventures. Cuddling a koala is a quintessential Aussie experience, and Lone Pine Koala Sanctuary is an ideal place to tick this off your bucket list. Other Australian animals such as kangaroos, wallabies, wombats, dingoes, snakes, and even crocodiles live in this compact sanctuary nestled on the Brisbane River. Daily encounters and experiences include bird of prey flight demonstrations, platypus feeding, sheep dog and shearing shows, Tasmanian devil keeper talks, and barn animal encounters. In addition to the ultimate cuddling a koala photograph, you can also take home a souvenir snap of you holding a snake or baby crocodile. A popular way to travel here is the Koala and River Cruise, departing from Brisbane's Cultural Centre Pontoon every morning. On the banks of the Brisbane River, the heritage-listed Cultural Precinct in South Bank is a fantastic, family-friendly destination for a day out, with a host of excellent museums, galleries, and performance venues. Award-winning architecture adds to the precinct's beautiful setting on the river near picturesque parklands, and you'll find plenty of things to do here for the whole family. Browse the excellent collections at the State Library of Queensland; keep the kids entertained with the Queensland Museum and Sciencentre's interactive exhibits; or ogle thought-provoking, cutting-edge art at the popular Queensland Art Gallery & Gallery of Modern Art (QAGOMA). The Queensland Performing Arts Centre (QPAC) here stages world-class performances of everything from opera and ballet to comedy shows and contemporary music concerts. Right nearby are the South Bank Parklands, where you can relax on the riverfront amid the lush lawns and gardens or take a ride on the Wheel of Brisbane. Offering panoramic views of Brisbane, the Brisbane Botanic Gardens Mount Coot-tha is a favorite attraction with locals and visitors alike. Not to be confused with the City Botanic Gardens, another serene oasis and prime picnic spot, the Mount Coot-tha gardens are seven kilometers from the city, with diverse themed gardens that take visitors on a journey through 128 acres of horticulture. Highlights include the beautiful Japanese gardens and the largest collection of Australian rainforest trees in the world, as well as sections dedicated to fragrant plants, bamboo, cactus, indigenous plants, and more. Budding botanists will love the Hide 'n' Seek Children's Trail through the rainforest, and you can take advantage of the free guided walks and minibus tours. Best of all, entry to the gardens is also free. While you're in the area, stop by the Brisbane Lookout Mount Coot-tha, about a four-minute drive from the gardens, for a breathtaking panorama over the entire area, with the city skyscrapers sprouting in the distance. Walking tracks weave through the national park, and a restaurant serves up delicious food with superb views. The excellent - and free - Queensland Art Gallery & Gallery of Modern Art (QAGOMA) occupies two adjacent but contrasting buildings along the waterfront in the South Bank Cultural Precinct. Together, they display more than 1,700 works of art from around the world, with a special focus on Australia, the Pacific, and Asia. This bold collection is sure to spark animated conversations between art lovers of all stripes. Even the Gallery of Modern Art's award-winning, glass-encased building makes a statement. Permanent exhibitions at the Queensland Art Gallery include the International and Asian Collection, with classic and contemporary works; the Indigenous Australian Collection; and the dramatic sculptures gracing the grounds. At the Gallery of Modern Art, exhibits span all mediums, including sculpture, painting, video, film, and photography. Special exhibits mean there's always something new to see here. Don't miss the fascinating contemporary art installations. Also within the complex, Australian Cinémathèque screens stimulating films from around the world, and the interactive exhibits at the Children's Art Centre keep little hands busy. The original site of World Expo in 1988, South Bank is filled with parklands, plazas, and promenades, as well as a diverse array of restaurants and exciting special events. This riverside paradise sits directly opposite the CBD, with Streets Beach at its center. A swim in the human-made lagoon is a popular choice on a warm Brisbane day. Other popular things to do here include working out at the free fitness classes, visiting the Epicurious Garden, and biking or strolling along the trails. You can also sign up for a host of free children's programs and tours. To celebrate the 150th anniversary of the state of Queensland, the Wheel of Brisbane opened here in 2008. The giant Ferris wheel is one of the top tourist attractions in South Bank and offers an exciting 10- to 12-minute ride with a bird's-eye view over the river and city during the day or night. The most scenic and exciting way to travel around Brisbane is by CityCat. Gliding the twists and turns of the Brisbane River seven days a week, the fleet of CityCats and City Ferries with 24 hop-on, hop-off terminals offer a range of different cruises, many with informative narration about the history and sights of the city. From the magnificent University of Queensland to the North Shore, the route takes in redeveloped industrial sites, riverside mansions, bridges, and parklands. This is an excellent way to gain a fresh perspective of Brisbane landmarks such as the Story bridge, Kangaroo Point Cliffs, and even some of the wildlife, like the fruit bats that gather along the mangroves on the riverbank. 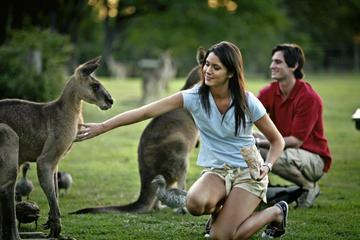 You can also hop aboard a Miramar Cruise to Lone Pine Koala Sanctuary. The CityHopper ferry service offers free cruises, stopping at attractions like South Bank 3 and the Maritime Museum. The vibrant Queen Street mall shopping precinct is home to more than 700 retailers showcasing local, national, and international designs and labels. In addition to the centrally-located, pedestrian-friendly street frontage, a labyrinth of heritage-listed arcades make it rewarding to explore the complex. Most Wednesdays, the area at the bridge end of the mall transforms into a bustling Farmers Market selling local produce, flowers, and artisan products. Constructed during Australia's Great Depression in the 1930s, the attractive steel Story Bridge is a much-loved Brisbane landmark. As one of only three bridge climbs in the world (after Sydney and Auckland), this one also offers something totally unique - the choice to abseil the descent. Catering to people of all fitness levels and those 10 years of age or older, the two-hour experience takes you 80 meters above the Brisbane River for uninterrupted views of the city. 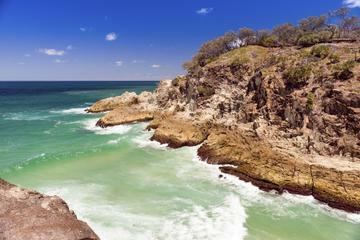 Easily accessible via a 75-minute ferry ride from downtown Brisbane, Moreton Island is the perfect day trip. As the world's third largest sand island and with more than 98 percent of the island designated as national park, Moreton Island is one of Queensland's best-kept secrets. Lush vegetation frames azure waters that lap the pure-white sandy beaches. Popular things to do here include diving and snorkeling the many shallow-water wrecks; feeding wild dolphins at the Tangalooma Island Resort; quad biking; and water sports, such as whale-watching cruises, fishing, and sea kayaking. Sandboarding and 4WD adventures are also popular. While you're here, try to visit Cape Moreton Lighthouse for beautiful ocean views. Housed in one of Brisbane's premier heritage buildings, this intriguing museum was redeveloped and reopened in 2013. This "small in size, big in stories" museum occupies the top level of City Hall and brings the history of Brisbane and its people to life through a series of state-of-the-art exhibitions covering everything from convict history to Brisbane's floods. Adding to the experience are the sweeping views of the city from the magnificent clock tower. Owned by the University of Queensland, this magnificent 19th-century building offers a cultural and educational experience. Although operating as a function center, Customs House includes plenty of public spaces, including an indoor/outdoor restaurant offering unparalleled river and Story Bridge views. The daily high tea here is popular with locals and visitors, but reservations are essential. Free guided tours of the building are available on Sundays, and free music concerts are often staged in the Long Room. Luxury Hotels: In a prime location, within walking distance of Queen Street Mall and South Bank, the great-value Capri by Fraser oozes personality, with its modern design, earthy art, and vertical garden. The hotel is also home to a popular restaurant headed by a famous Aussie chef. A little further out but still within walking distance of the city's top attractions, The New Inchcolm Hotel & Suites Brisbane - MGallery Collection scores top points for its well-appointed rooms and modern elegance. For those who prefer large chain hotels, the Sofitel Brisbane Central delivers on amenities with a heated pool, fitness center, and spa. Mid-Range Hotels: In a superb location, close to public transport hubs and an easy stroll from Queen Street Mall, the Cultural Centre, and South Bank, Meriton Serviced Apartments Brisbane on Herschel Street, offers exceptional value - especially for extended stays and families. A little further out, but still handy to the city center, Punthill Brisbane, near Central Station, has modern studio apartments and a swimming pool. Across the road from a lovely park, the Watermark Hotel is a ten-minute walk from the CBD with clean, quiet rooms and a swimming pool. Budget Hotels: At the high end of the budget hotels, BEST WESTERN PLUS Gregory Terrace Brisbane lies within walking distance of the CBD, while the Bowen Terrace International in New Farm is only a few minutes away by car. This charming home offers single rooms, dorm rooms, family suites, and a pool. On the banks of the Brisbane River and handy to public transport and the airport, Kingsford Riverside Inn offers good-value rooms with shared bathrooms. Breakfast is included in the rates. See the Sights: If you want to see and experience all the city's highlights in one day, the Best of Brisbane Full-Day Sightseeing Tour is a fun adventure that allows you to view the city from multiple angles. Start your day with a scenic coach tour around the historic landmarks, then hop aboard a boat and cruise along the beautiful Brisbane River before heading to the top of the Brisbane Wheel and Mount Coot-tha Lookout for panoramic city views. This tour also includes a trip to Lone Pine Koala Sanctuary, where you can cuddle one of these lovable creatures and get up close to other Aussie wildlife. Save Money: If you plan on hopping between the theme parks during your stay, you can save money with the Gold Coast Theme Park Pass. This great-value ticket includes entry and unlimited rides and attractions for Movie World, Sea World, and Wet 'n' Wild. You can also choose between a pass that's valid for seven or 21 days, giving you maximum flexibility to plan your itinerary. Springbrook National Park Day Trip: Escape the hustle and bustle of the city and experience the breathtaking beauty of a World Heritage-listed wilderness on the Springbrook National Park Discovery Full-Day Bushwalking Tour. This wilderness adventure includes a guided bushwalk, a picnic lunch at pretty Purlingbrook Falls, and the chance to swim in rainforest pools and see interesting rock formations. This is a small-group tour, with a maximum of 15 people, and includes expert guides, picnic lunch, transportation in an air-conditioned minivan, national park fees, and hotel pickup and drop-off. Lamington National Park Day Trip: You can explore yet another stunning World Heritage-listed wilderness area on the O'Reilly's Lamington National Park and Tree Top Canopy Tour. Birds are a highlight on this full-day excursion, which gives you the chance to hand-feed colorful flocks of king parrots and see bowerbirds, lyrebirds, and wedge-tailed eagles. The day includes a canopy tour at O'Reilly's Rainforest Retreat in the heart of the rainforest and a visit to an alpaca farm on the way home. Entrance fees, the tree top canopy walk, round-trip transportation with commentary, and hotel pickup and drop-off are included in the tour.